Historical events can leave marks on the forest landscape in many different ways. One of the more robust historical markers researchers can use to uncover the events of the past are tree scars: marks that disturbances like fire leave behind in the annual growth rings of trees. In order to reconstruct the fire history of Alberta’s southern Rockies, the Landscapes in Motion teams have become experts at detecting, and differentiating between, these markers. How to study scars? Work from the inside out. A tree that has been affected by fire in its past may carry signs on its bark in the form of a scar like the one pictured on the left. While this makes it relatively easy to pick out which trees have been affected by fire, it doesn’t tell our research team much else - when did the fire happen? What impacts did the fire have on this forest? Gathered from many trees, the answers to these questions will help the Landscapes in Motion team build a bigger picture of what happened on the landscape and when. To learn more about the tree’s story, the Fire Regime field crew takes samples from each tree by cutting out a cross-section. These samples are then transported to Dr. Lori Daniels’ Tree Ring Lab at UBC. Here, dedicated technicians can take a look at each sample and figure out when the scarring happened by cross-dating the tree rings. Left: Markers of disturbance: this tree bears a tell-tale scar from a previous fire. Photo courtesy of Cameron Naficy. Cameron Naficy (centre) discussing the fire scars on some lodgepole pine samples at a site near Sheep River Provincial Park. He is joined by Alex Chubaty, fRI Research (left) and Ceres Barros, Landscapes in Motion/UBC (right). Photo by S. Odsen. Not all tree scars mean the same thing. The Fire Regime Team looks for fire scars so they can take samples and determine when a fire burned and how many trees it affected. To do this, it’s very important that they don’t collect data from trees that are scarred for other reasons! In the region where the team works, one of the main look-alikes they contend with are scars left by insect infestation. There are a few ways to tell a fire scar from a scar caused by disease or insects. A scar caused by a beetle attack, for example, might have blue staining on the wood. This is because many species introduce blue stain fungi, which help overwhelm the tree’s defenses and provide a food source for the beetle. Trees attacked by insects might also have red shadows on the wood, which are stains caused by sticky sap called pitch that trees pump out to defend themselves. 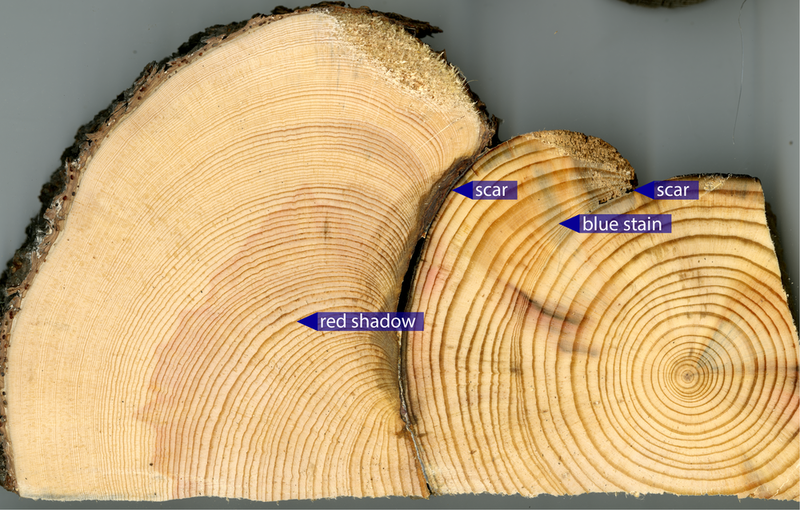 A tree cross-section with arrows indicating blue staining and red shadows on the wood characteristic of a mountain pine beetle attack. The dark notch on the right is the scar, which would also likely be visible on the outside of the tree. Photo courtesy of Cameron Naficy. This tree has two scars, but it’s not totally clear which type each one is. The signals of insect attack (blue stain and red shadow) are not clearly associated with one scar over the other. Our team’s best guess, based on the physical clues alone, is that the inner scar is due to mountain pine beetle while the outer scar is from a fire in 1896. Photo courtesy of Cameron Naficy. Cameron himself admits that it can still be tricky to tell apart tree scars based on appearance alone! Not every tree reacts the same way, and it can be especially difficult to figure out what’s going on when different types of scars are very close together. It might then surprise you to hear that the best clue of all for figuring out the difference is actually the clustering of scars in time. While a fire affects all trees in an area in the same year, insect attacks do not happen as synchronously. Rather than looking directly at individual trees in the field, the best way for our research team to figure out what type of scar they’ve found is to bring many samples to Dr. Daniels’ Tree Ring Lab. Once a date is assigned to each scar, trends start to emerge. For example, our team concluded that one of the scars on the tree below was due to a fire in 1910 because many other samples in the area also had a scar from the same year. Although tiny and not very distinct, the left-most scar can be traced back to a fire by comparing the scars on this sample to those of other trees in the same area. The other two scars on either side of this sample, although they appear potentially to be in the same year, were actually almost a decade apart. Since neither was consistent with fire scar dates from nearby samples, our team concluded that these were beetle scars. Photo courtesy of Cameron Naficy. The term “attack” is commonly used to describe these infestations, but they are most often part of natural cycles that have played out for centuries. It might surprise you to hear that insect attacks and fire often work together to help regenerate forests after fire. There are many kinds of organisms, like wood-boring beetles, that feed on dead wood; they are an important part of helping dead wood decay, returning nutrients to the soil and helping new trees grow. This process can be especially important for areas where fire may have burned away most or all of the organic matter in the soil. Some insect species attack living trees and are considered economic pests because of the damage they cause. Mountain pine beetles are an important example in Alberta and British Columbia, where warm winters have allowed their populations to achieve unprecedented population outbreaks. These tunnels under the tree bark were formed by mountain pine beetles. There is also some blue staining on the wood from the blue stain fungi that the beetles introduce when they attack. Photo from Natural Resources Canada - Mountain Pine Beetle Factsheet. But many other beetle species don’t typically attack healthy trees. Instead, they go for trees that are dead, dying, or weak. Many of these species, like the aptly-named Black Fire Beetle, are specifically drawn to trees that have burned. If you walk through a forest that burned within the last two years, you might even be able to hear the creak-creak of larvae chewing through the burned trees. The droppings left behind by these beetle larvae—called frass—can even lead to increased microbial activity in soils. The difference can be as much as three times compared to soils without frass! Microbial activity plays an important role in nutrient cycling, which is crucial to regenerating forests. In a study by University of Alberta researchers, the presence of frass was even related to differences in the species of trees that grew back . Wildfire changes ecosystems in more ways than just burning trees. Something as simple as insect droppings can change the nutrient composition of the soil and which trees regenerate . While we tend to think about destructive species like mountain pine beetles, there are many more species that don’t attack healthy trees but do play an important role in helping forests recover after fire. Here at Landscapes in Motion, we’re keeping our focus on the fire scars instead of the beetle scars or frass. But at the heart of it, these are all processes that are part of a larger system of disturbance, regrowth, and landscape change. The lessons we learn about how wildfire has shaped the landscapes of the southern Rockies will help us tell the story of how they might change in the future. This, in turn, might help future researchers trying to understand the future of deadwood-eating beetles, the frass they leave behind, and their combined effects within these complex systems. Every member of our team sees the world a little bit differently, which is one of the strengths of this project. Each blog posted to the Landscapes in Motion website represents the personal experiences, perspectives, and opinions of the author(s) and not of the team, project, or Healthy Landscapes Program. Rice, A. V., M. N. Thormann, and D. W. Langor. 2007. Mountain pine beetle associated blue-stain fungi cause lesions on jack pine, lodgepole pine, and lodgepole jack pine hybrids in Alberta. Canadian Journal of Botany 85: 307–315. Cobb, T. P., K. D. Hannam, B. E. Kishchuk, D. W. Langor, S. A. Quideau, and J. R. Spence. 2010. Wood-feeding beetles and soil nutrient cycling in burned forests: implications of post-fire salvage logging. Agricultural and Forest Entomology 12: 9-18.